It would be appropriate to have one computer in a workgroup with reference settings of local group policies and security settings to be applied to the other computers and after you make any changes you could copy this configuration to other machines. In this article we’ll consider this scenario. It allows to quickly export and transfer (migrate) local group policy settings from one configured computer to other computers in a workgroup. The easiest way to migrate local GPO settings between computers is to manually copy the contents of %systemroot%\System32\GroupPolicy folder (by default, this directory is hidden) from one computer to another with replacing its contents (after you replaced the files, run policy update manually using the command gpupdate /force or by restarting your PC). There are some issues when migrating custom ADMX templates. To import/export a local GPO created with gpedit.msc, it’s easier and more convenient to use LocalGPO utility, which is a part of Microsoft Security Compliance Manager 3.0. LocalGPO allows not only to quickly create a backup of a local GPO and restore local policy settings, but also to create an executable file GPOPack to migrate (import) the local GPO settings to another machine in one click. Important note. The LocalGPO utility is now deprecated and not officially supported by Microsoft. In addition, it doesn’t work in modern Windows 10 and Windows Server 2016 (although this limitation can be bypassed by modifying the script code, which is described below). 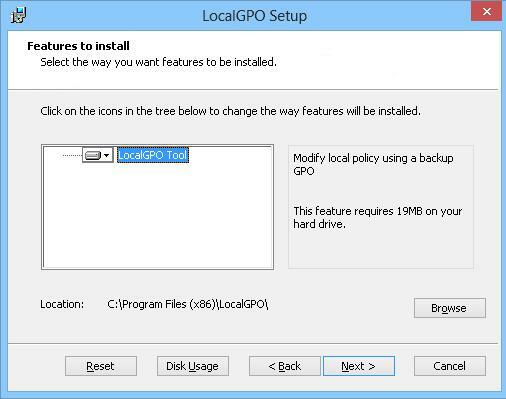 To export, import and transfer local GPO settings between computers, it is recommended to use the tool LGPO.exe (examples of using this utility can be found in the last section of this article). The LocalGPO tool allows you to export all local policy settings, including those from INF, POL, Audit, firewall sections, etc. LocalGPO perfectly suits for use in the companies without domains to distribute GPO template between computers in the workgroup. It is also very useful in conjunction with the Microsoft Deployment Toolkit (MDT) or SCCM. Open Security_Compliance_Manager_Setup.exe as an archive file using any archiver (7Zip or WinRar). Note. We don’t want to perform a full installation of Security Compliance Manager since it’s quite heavy and contains a lot of components we don’t need for our task (SQL Server Express, Microsoft Visual C++ 2010 Redistributable, etc.). Let’s find out how to use LocalGPO. You can manage it only through the console interface (command prompt). Start the command prompt as administrator and go to the folder C:\Program Files\LocalGPO (for x86 systems) or C:\Program Files (x86)\LocalGPO (for x64 systems). A new folder with some GPO GUID appears in the target directory. It will contain all local policy settings for this computer. Actually, we have created a local GPO backup, which can be rolled back to any time we need. Copy the folder created in the previous step to another computer, to which these policies have to be applied. To do it, start the command prompt with the administrator privileges and run GPOPack.wsf file. The message “Applied GPOPack to Local Policy” indicates that the policies have been migrated successfully. Now you only have to restart your system and make sure if the same local GPO settings are applied on this computer. Tip. Earlier we have already shown how to reset the local GPO configuration manually. 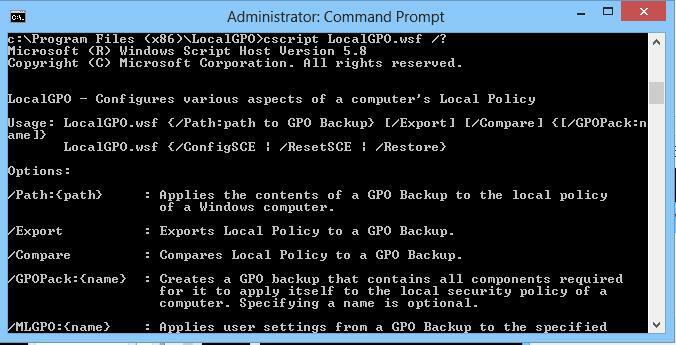 The policy import format of LocalGPO allows to import local group policy settings to a domain GPO. You can do it using the domain GPO backup and restore feature in GPMC (Group Policy Management Console). The LGPO.exe console tool is designed to automate the management of local group policies and is intended to replace the LocalGPO that is no longer supported. Currently it is recommended to use only this utility. 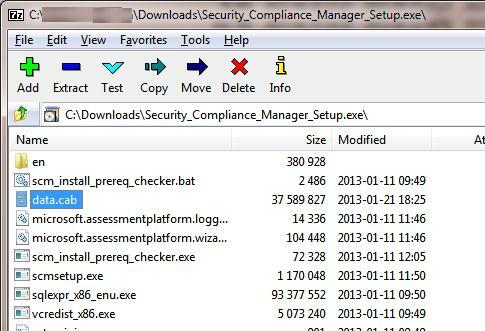 LGPO.exe is included into the Security Compliance Manager (SCM) free tool. You can download LGPO.exe by the following link https://www.microsoft.com/en-us/download/details.aspx?id=55319. Convert registry.pol files to readable LGPO format and vice versa. The utility will export all current local policy settings to the folder with the group policy GUID. Open the lgpo.txt text file. As you can see, it contains all registry settings that are applied by this policy. The LGPO v2.2 version supports Multiple Local Group Policy Objects (MLGPO), which allows you to configure individual policies for different users (available in Windows Vista and later). As you can see, the LGPO.exe utility is very useful for creating a backup of local policies and transferring GPO settings between computers. This is great for 2008/2008R2, but it does not work in 2012/2012R2. Even after you edit the wsf script to stop it from checking for OS (which, if you leave that in, it will TELL you that it cannot run in 2012), but even after commenting that check out, it will run, but it will not actually import the policy settings. This tool does not run on windows 10 Pro 64 bit. What is other alternative? Dont Work for Windows 8.1. This tool is only for Windows 8 and before. Hi, thanks for info! I updated your code (this is an old WordPress problem with quotes).